This is February’s edition of Comet Over Hollywood’s classic film references in music videos. 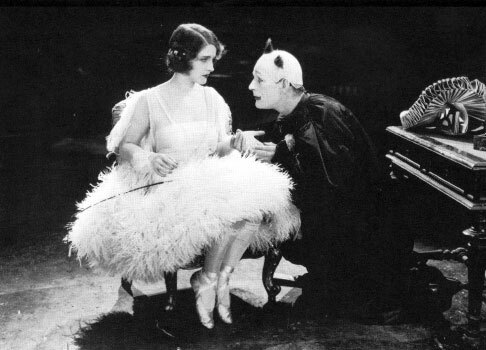 The music video is in black and white and modeled after a silent film and is very similar to the Lon Chaney movie “He Who Gets Slapped” (1924). In the music video one clown, dressed in white, is in love with a beautiful circus performer. She laughs at his love and keeps company with a mean clown who wears black. At the end of the video, the white clown gets killed by a tiger. This is similar to “He Who Gets Laughed” because Lon Chaney is in love with Norma Shearer, who also laughs at his love. She is in love with horseback rider John Gilbert, but is determined to marry an evil rich man. In the end, Lon Chaney dies from a tiger attack like in the video and it is caused by the rich baron. Check back in March for the next classic film reference in music videos. February’s beauty tip is also coming soon! This entry was posted in Music Video Film References and tagged Blondie, Good Boys Video, He Who Gets Slapped, Lon Chaney, Norma Shearer by Jnpickens. Bookmark the permalink. Yay, Blondie! I’m a huge Blondie fan and this is my favorite of their newer songs. The fact that the music video is silent film inspired is icing on the cake. 🙂 I’m glad you enjoyed it! I really liked this song back in high school and had completely forgotten about it. I came across it randomly a week ago and then noticed how perfect the video was! Blondie is one of my all-time favorite bands, so I love that you posted this. In reading bios of Debbie, she has said that she’s been heavily influenced by classic films and of course the platinum-haired bombshells from different eras (just take a listen to “Platinum Blonde”!.